Would you travel with a huge balloon-type vehicle filled with explosive gas across the ocean? The 1930s saw a brief period when airships had a technological edge over planes and transatlantic Zeppelin flights made an early service across the ocean possible. German airships are generally known as Zeppelins after Count von Zeppelin, the German airship pioneer. He started the world’s first airline in 1909 already using airships. Persisting in improving their despite the success of aircrafts, German Zeppelins grew bigger and more reliable after the First World War. 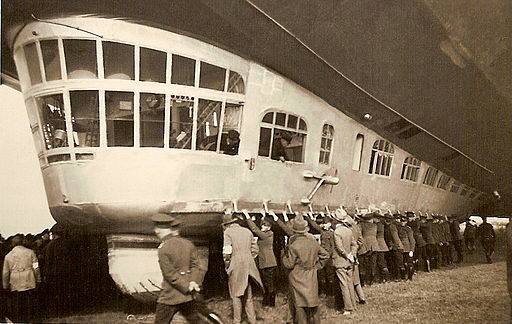 The LZ127 Graf Zeppelin named after Count von Zeppelin launched in 1928 was the most successful airship of all times. It completed a circumvention of the world in 1929 and a trip to the North Pole in 1931 among other flights. Building on the long-range capabilities of LZ127, regular transatlantic Zeppelin flights were established in 1931. Flights to the USA were offered, but here regular steamer connections were a considerable competition for the Zeppelins. Both made the crossing in about 4 days. Steamer connections to Brazil were not that fast. Here, the transatlantic Zeppelin flights offered extra value. Mail and passengers could travel from Germany to Brazil in a few days. LZ127 made 136 crossings of the South Atlantic without accident. The ship had an impressive length of 236 m and a crew of about 40 people. It could however only carry about 25 passengers making it a very expensive, high-end service. In 1936, a second Zeppelin entered service for transatlantic flights: LZ129 known as the Hindenburg. It was even larger with about 250 m length an had an increased passenger capacity of over 50. In order to make an airship fly, you need a lighter-than-air gas. There are basically two choices available: Hydrogen and Helium. While Hydrogen is lighter and easier to obtain, it is explosive. Helium on the contrary is safe to use but scarce. In the 1930s it was only available in the USA as a byproduct of natural gas production. The risks of using hydrogen for airships were known and several ships caught fire throughout the world over the years. The Hindenburg therefore was planned to use Helium to eliminate the obvious risk. In 1936 however, the USA had established a trade embargo against Nazi Germany for Helium and Hindenburg was launched with Hydrogen as Graf Zeppelin and many other airships before. Hindenburg made 17 transatlantic flights before it exploded at its destination at Lakehurst near New York on 6. May 1937. 36 people died in this first airship accident with casualties since World War I. Early radio and film coverage made the accident a lively and emotional experience and people started asking themselves if it is a good idea to travel with a huge balloon-type vehicle filled with explosive gas across the ocean. This was the end for transatlantic Zeppelin flights and commercial airship operations overall. Few years later, planes had reached a long range capability that they could offer transatlantic passenger services and compete successfully with steamers.